With a 4-1 Sarasota City Commission vote on April 4 and a unanimous vote of the County Commission on April 12, the community’s draft updated Consolidated Plan for the allocation of federal housing funding — including assistance to the homeless population — will be advertised for public comments for 30 days, Don Hadsell, director of the Office of Housing and Community Development in Sarasota, told both boards during regular meetings. Hadsell is working on a timeline that would see him sending the document to the U.S. Department of Housing and Urban Development (HUD) by Aug. 15, he has said. The five-year plan is to go in effect on Oct. 1, at the start of the next fiscal year. As he explained to the County Commission on April 12, the document assesses the needs in a community and the resources available to meet them, sets priorities for how those resources will be used and describes the activities that will take place to implement the plan. Because the City and County of Sarasota formed a consortium years ago to receive one specific type of federal funding, Hadsell has explained, both local governments must agree on various steps of the process to approve the document. However, while the city and county cooperate on the allocation of money from that fund, they set separate priorities for other types of federal assistance. On Nov. 16, 2015, when City Commissioner Shelli Freeland Eddie sought clarification about the wording, Hadsell told her that it refers to a physical location. No other city commissioners offered comments at that time. One facet of handling the community’s homelessness problems on which the City and County commissions have agreed “is that a centralized intake system is necessary. Whether it’s one site, multiple sites, is still up for discussion,” Hadsell replied. 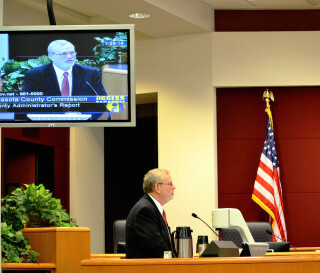 Hadsell acknowledged the differing views of the boards on April 4 and noted, “But there’s nothing included in this grant [for a shelter for homeless people] with the exception of the money that you have allocated [to The Salvation Army for 10 beds].” Sarasota County has its own programs, he added, and the County Commission has made it clear it plans to pay for a come-as-you-are shelter with funds from a source other than federal grant money, he told Chapman. 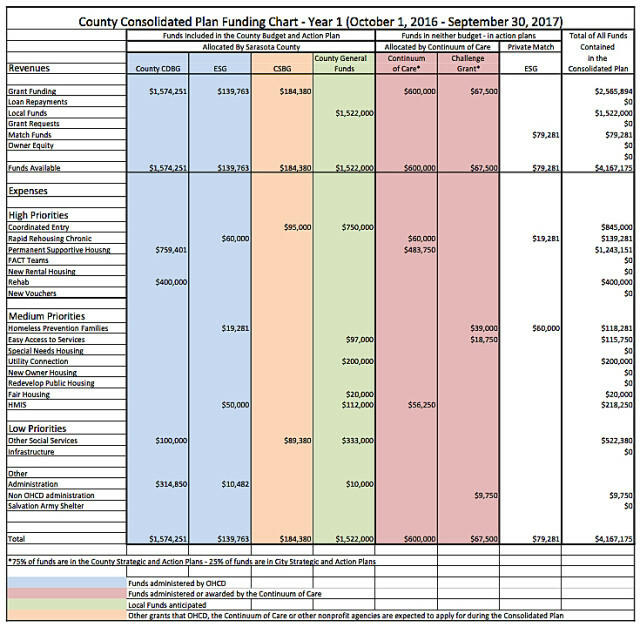 A chart Hadsell presented to the County Commission on April 12 showed $95,000 from one funding source for the “coordinated entry” priority, while the County Commission agreed to put $750,000 toward that purpose from its own pool of HUD money. 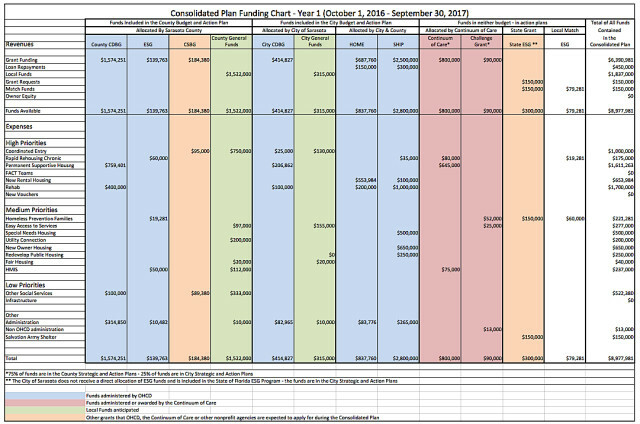 Those allocations are scheduled for the first fiscal year the new Consolidated Plan is in effect, he pointed out to the county board. $206,862 for permanent supportive housing, which will be awarded to nonprofit housing providers to create dwelling units for the homeless and for persons with special needs. During his discussion with the City Commission, Hadsell pointed out that the highest priority for use of that funding was on home ownership in the past. He suggested this money in the latest Consolidated Plan be set aside for “gap funding,” to aid people who cannot obtain private financing or assistance through other sources. The only money for rental housing in the past, he continued, had come through a bond revenue program involving the Lee County Housing Finance Authority and the City of Sarasota and City of Venice housing authorities; it was used to redevelop their public housing units. Freeland Eddie pointed out that part of the City Commission’s recent focus has been on the creation of new rental units with housing tax credits, as a function of a public/private partnership. “So this is an opportunity for us to stretch in this area,” she noted of the CDBG allocation. $110,000 for housing rehabilitation, which will be used to assist families who may not qualify for other federal housing assistance because of more stringent restrictions on those separate grants. $25,000 for the city’s Homeless Outreach Teams, whose goal is to help the city’s chronically homeless people get help from community providers. The funds will pay for social service case workers who are part of the teams. $82,965 for administering the CDBG program “in conformance with federal law,” according to the backup agenda material for the April 4 discussion. Among other first-year expenditures will be $200,000 for the City of Sarasota Housing Rehabilitation Program, which provides 0-percent interest rates to owner-occupied, lower-income families to repair their dwelling units. “This funding will assist an estimated 15 families,” the agenda material says. Further, $450,820 has been set aside for a new program to create additional affordable rental housing for persons with incomes below 80 percent of the area’s median income. 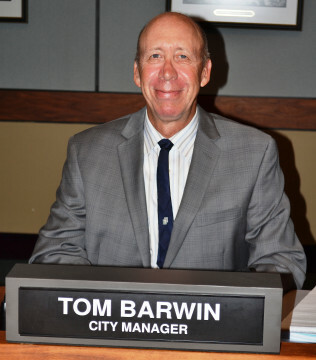 City Manager Tom Barwin pointed out that the true impediments to affordable housing “really are the costs of land here” and getting private developers more involved in that type of market. The city’s Housing Authority, he continued, has about 2,000 units, and a two- to three-year waiting list that includes the names of people who qualify for such housing because their incomes are no higher than 50 percent of the median for the county. “An obstacle is the vast shortage of units,” Barwin added. Even if the city can get commitments from developers to rent to low- or moderate-income tenants, he said, “there are absolutely no regulations that can bind [the developers]” to setting aside those units for that purpose over a long term. Hadsell told the board that a community committee established to address affordable housing has two meetings scheduled this month. After those have been conducted, he said, the group will provide recommendations to the City Commission. Following about 30 minutes of discussion, the city board members voted 4-1 to authorize Hadsell to advertise the draft Consolidated Plan for public comments. Mayor Willie Shaw cast the “No” vote. In November, Shaw voiced disapproval in the apparent shift of community focus in the plan from making sure affordable housing is available to establishing a shelter. When he discussed the next five-year Consolidated Plan with the County Commission this week, Hadsell noted he had worked with the county’s staff that oversees services for the homeless in regard to facets of the document addressing those issues. A steering committee comprising representatives from the city, the county and the Cities of Venice and North Port held six public meetings in the process of crafting the draft plan, Hadsell explained. One session was held solely for providers who work with the homeless and special needs populations in the county, he added. 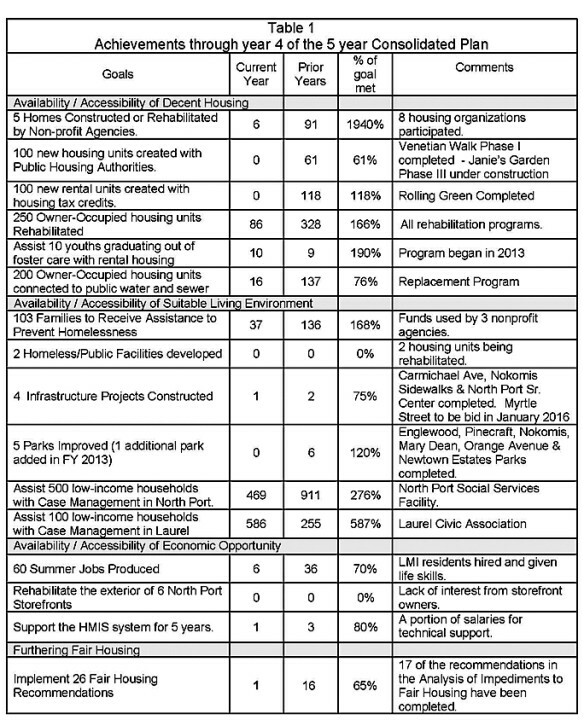 $759,401 for permanent supportive housing. $400,000 for housing rehabilitation assistance to families who may not qualify for two other types of funding aid. $54,000 to hire more social service case workers at the North Port Social Service facility. Those workers screen applicants and identify social services needed for lower-income families, according to a memo Hadsell provided the county board. $46,000 to hire one social service case worker at the Laurel Civic Center to screen applicants and identify social services needed by lower-income residents. $314,850 for administration of the CDBG program in conformance with federal law. $50,000 for administration of the Homeless Management Information System (HMIS), which HUD requires for the tracking of homeless individuals and families. $19,281 for an ongoing program to assist families who are in danger of becoming homeless; it provides funds for rent on a short-term basis or mortgage payments. $60,000 for a continuing program to assist chronically homeless individuals in obtaining housing. 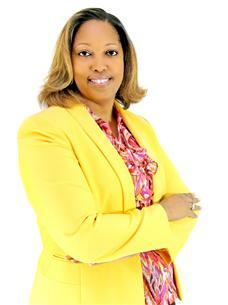 County Commissioner Carolyn Mason made the motion to authorize the advertisement of the draft plan for 30 days. Commissioner Charles Hines seconded the motion, and it passed unanimously. The comment period will end on May 20, Hadsell noted in his memo to the board. 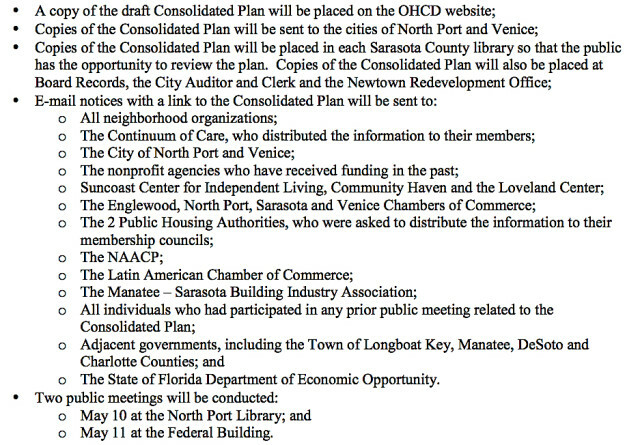 Copies of the plan will be available in each Sarasota County library, Hadsell’s memo said, and it will be on the Office of Housing and Community Development website. Email notices with the link to the plan will be sent to a variety of organizations as well as to the Cities of North Port and Venice, the memo added.